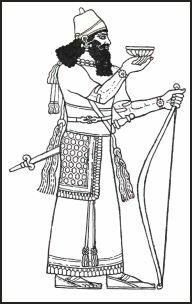 Ornament upon the costumes of the Nimrod bas-reliefs was most certainly of embroidery. 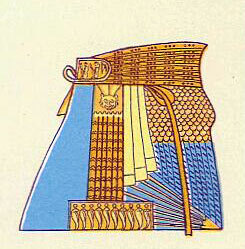 It is probable that the Israelites learned the art of embroidery during their stay in Egypt. The ornamentation of woven fabrics, especially of linen, by needlework in threads of different colours, spun or drawn from various materials, such as wool, flax, or gold, was known to ancient nations. 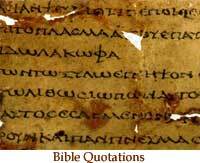 The Bible is replete with descriptions of embroideries, frequently referring with minuteness to their details. But, above all, it surprises one to find that embroiderers at those remote times had brought their art to so high a standard of execution as to be able to render the most elaborate of subjects. In Exodus, for instance, we read how Moses caused a veil or curtain of fine twined linen to be cunningly embroidered with cherubim of blue and purple and scarlet, for the holy of holies. It was bordered with loops, and made fast by fifty gold rings to gilt-wood pillars. Solomon, whose splendours are proverbial, ordered a curtain to be made for the Temple of azure-coloured material, upon which purple and scarlet cherubim were embroidered. On other hangings he directed that all sorts of flowers and fruits of the earth should be embroidered. 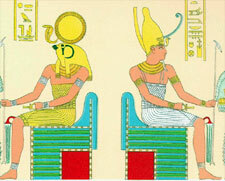 Everything, in fact, suited to ornamental treatment, excepting representations of animal life, was used. 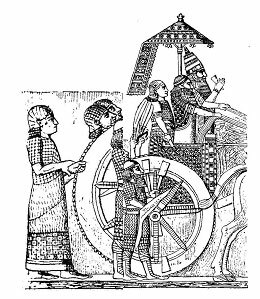 Ezekiel in his lamentation for Tyrus—" situate at the entry of the sea, which art a merchant of the people for many isles "—exclaims, "The merchants of Sheba, Asshur, and Chilmad were thy merchants. These were thy merchants in all sorts of things, in blue clothes and broidered works, and in chests of rich apparel," etc. Another part of the same chapter (xxvii.) speaks of the "fine linen with broidered work from Egypt,"
Mummy cloths dating from the ancient egyptian dynasties show that Egyptian cultivated the art of embroidery earlier than the Jews. Many of the paintings upon sarcophagi clearly reveal the embroidery of clothing worn by important personages. Cotton was unknown at that time: Linen was supossed to be the fabric of the Gods. 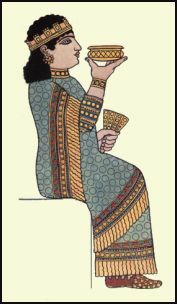 Life in Ancient Egypt and Assyria, Gaston Maspero. THE SEVEN GREAT MONARCHIES OF THE ANCIENT EASTERN WORLD BY GEORGE RAWLINSON.